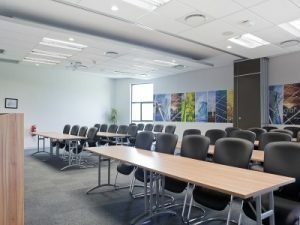 SARETEC offers a fully serviced green conference venue that meets the needs of modern events. The venue is available throughout the year for workshops, symposiums, seminars and conferences. All venues are fully equipped with the latest in Audio-Visual Equipment. The fully air conditioned venues offer total comfort in an eco-friendly manner, with power sourced from the buildings integrated solar and wind energy systems. SARETEC is conveniently situated centrally between Cape Town and Stellenbosch, within proximity of both the national highways and a 10 minute drive from Cape Town International Airport and hotels within the vicinity of the airport. The SARETEC team is available to cater to all your needs and requirements to ensure that you have a memorable and successful conference. Should you wish to host an event at SARETEC please feel free to contact us on events@saretec.co.za to discuss your needs, availability and pricing options.